There is a bunch of discussion going around about seeing representation in comics and videos and such. It seems that when minorities take over a white superheroes job and name it’s fine but if it goes the other way it’s white washing. I’ll probably make a post about that and why I have problems with some upcoming characters like Kamala Khan as Ms Marvel. While she will be the basis of that blog this random thought has her as the main point too. Of all people, she replaced Ms Marvel as that namesake when, with her power set and all, shouldn’t she be called Ms Fantastic or something similar? 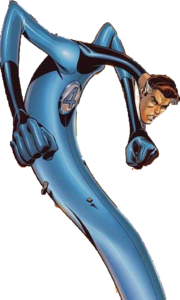 After all she has the same power set as Mr Fantastic so if you’re going to let the next gen steal the older gens names why not at least match their power sets right? Just seems odd to m and makes it feel forced in a way like they are just trying to get this character put in here somehow to appeal to a certain demographic or group. I think this is a good topic Kevin because Marvel (Disney) seems to be pushing this big time. 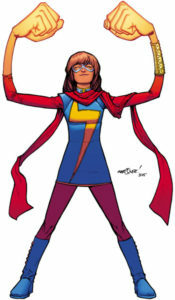 I don’t think it’s a bad idea to have characters that represent everyone, but I do think Marvel (and they’re not alone in this) like to create controversy by having someone take a role such as Kamala Khan becoming Ms. Marvel. We’ve discussed this before. Marvel has always been about the illusion of change. When James Rhodes took over as Iron Man for Tony Stark, few people thought the change was going to be permanent. Much the same as Steve Rogers getting old or becoming a Hydra loyalist. I think diversity in comics is great and Marvel has a history of diverse characters. The only problem is when they create controversy in order to sell books. It’s similar to when STAR WARS: THE FORCE AWAKENS introduced Finn and three people complained about a black Stormtrooper, but Disney and the media made it sound like there was this firestorm of controversy. I wouldn’t have actually thought about this had you not brought it up here. I think it’s great though that they are getting demographics represented but I think you and Kevin had raised good points here, especially that Marvel has this thing about thinking they’re making a sort of impact with how they do things. The controversy isn’t a really big issue for me but this definitely can be a point for discussion.